The “Ultimate Guide to Buying Apartment Buildings” is the BEST system on the planet to help you quit the rate race in 3-5 years. 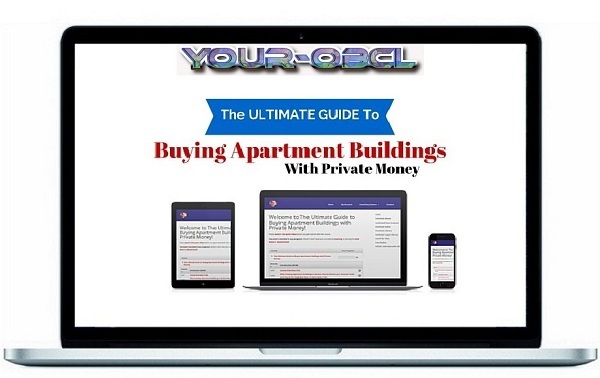 You’ll get instant access to my proven step by step process of buying apt buildings with other people’s money. You’ll become a master at analyzing deals so that you’re able to make more offers. You’ll be able to quit your job, retire, or do whatever you want to do. That’s my 3-5 year real estate retirement plan for you. That’s my passion … to help people like you do their first apartment building deal. I have the system and the tools to make you successful. What I teach works any where and any one can do it if you follow what I teach in my system. It’s like having me in your living room for one-on-one coaching for 8 1/2 hours. At my hourly coaching rate that would cost you $4,250. Includes the most popular apartment analysis tool on the planet, the “Syndicated Deal Analyzer”. Learn my “10-Minute Offer” technique that lets you determine the most you can pay for a property in just 10 minutes. This bonus is designed to make you a Deal Analysis Master! Each of the 6+ video case studies is about 45 minutes long, and I analyze a deal from start to finish, including several “what-if” scenarios. Watch me do it, then download the marketing package and do it yourself. You’ll be a Deal Analysis Master in a week, and that in turn will let you make more offers more confidently. This $500 package is normally only available to my Mastermind students but they’re yours – FOR FREE – if you purchase my system before this Sunday at midnight EST. Everything you need to do your FIRST apartment building deal using other people’s money. How to “Manage the Manager” to Drive Profits. What’s more profitable? Flip or hold long-term, or perhaps a cash-out refinance or 1031 Exchange? ($594 Value)When you sign up, you’ll also get 6-months access to my “Deal Maker’s Mastermind” (DMM) program, which will help you to become a “Deal Master”, someone who can analyze deals quickly and accurately and make offers with a high degree of confidence. The DMM is a monthly subscription of $99 per month, and I’m including 6 months for free if you sign up today. That’s a total value of $594 that’s included in your investment for a LIVE person to give you feedback on your analysis so that you can make offers confidently. After your first 6 months, you’ll be charged $99 per month if you want to continue the service. Once you register for the program, you’ll get 2 free tickets to attend the upcoming Financial Summit Live Event. In this hands-on workshop, you’re going to experience what it’s like to do your first deal – a 69-unit property in Memphis – from start to finish. Working in small groups, you’re going to find the deal, analyze it, make offers and get it under contract. You’ll find and evaluate different financing sources, and you’ll raise money from investors. You’ll go through due diligence and encounter various twists and turns: will the deal actually close? By the time you’re done, it will be like you’ve done your first deal. Your comfort zone will have expanded exponentially, your mind … blown.